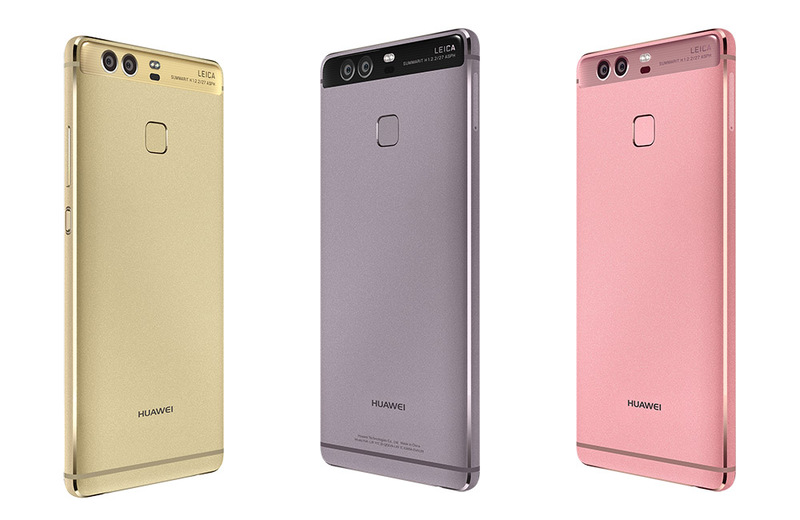 This morning, at an event in London, Huawei announced two new P-series flagship smartphones, the P9 and P9 Plus. Neither will make its way to the US any time soon (probably never), but since they are the new 2016 flagships from a company aiming to take on Samsung and Apple (and may be able to do it), the phones are worth talking about, especially since they were also co-engineered with Leica, the German camera expert. 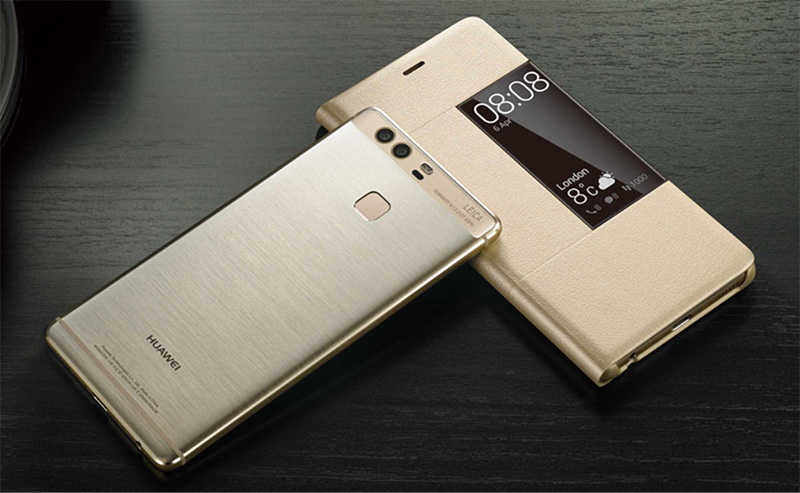 With the Huawei P9 and P9 Plus, you are getting aerospace-class aluminum bodies with metal polishing, 5.2-inch and 5.5-inch 1080p displays, Huawei-made Kirin 955 (64-bit) processors, 3GB/4GB RAM and 32GB/64GB storage (depending on model of each), 3000mAh and 3400mAh batteries (with fast charging), fingerprint sensor, 12MP dual cameras (monochrome and RGB), 8MP front cameras, and Android 6.0 underneath Huawei’s EMUI 4.1. In terms of specs, outside of having a QHD display, they have all that you could ask for in a flagship phone. In the camera department, where Huawei co-engineered each phone’s dual camera with Leica, you get two shooters, one RGB and one monochrome, to deliver better low light imagery, better contrast, and “superior detail.”You can even shoot individually with the monochrome camera to take stunning black and white photos that aren’t enhanced by a filter – they are actually taken in black and white. The processing on the phone is working some magic between the two cameras to create a camera performance that Huawei says destroys both the Galaxy S7 and iPhone 6s Plus. The phone begins shipping April 16 all over the globe, just not in the US. We’ll see what we can do to get a hold of one, though. 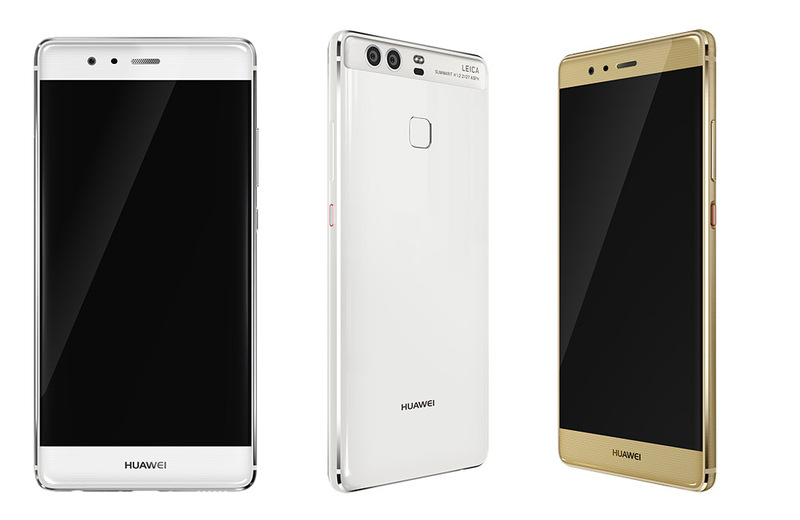 London – April 6, 2016 – Today at an exclusive launch event at London’s Battersea Evolution, Huawei Consumer Business Group unveiled the much anticipated Huawei P9 and P9 Plus. Created in collaboration with Leica, the dual-lens P9 sets a new standard in smartphone photography. A groundbreaking moment for event guests included a first look at an exclusive trailer of the new Huawei P9 TV commercial starring Henry Cavill and Scarlett Johansson, Global Product Ambassadors for the Huawei P9 series. Showcasing the connection between two global stars in Shanghai and Hollywood, the trailer symbolizes the partnership between Huawei and Leica and the intersection of color and black and white. Cavill was joined at the P9 launch by iconic photographers Mary McCartney and David Guttenfelder from National Geographic as well as BBC Global News CEO Jim Egan, Condé Nast Chairman and Chief Executive Jonathan Newhouse, Vogue China Publisher Anita Chang and Huawei UK Board Members Sir Andrew Cahn and Dame Helen Alexander. The P9 is a masterpiece of state-of the-art industrial design, with the same minimalist design DNA as earlier products in Huawei’s acclaimed flagship P-series of premium smartphones. Each P9 device is a perfect construct of superior-grade 2.5D glass and an aerospace-class aluminum, with diamond-cut edges rounded out by carefully balanced curvatures. The 64GB version of the P9 comes in a stunning and unique Haze Gold finish, setting new industry standards in industrial design, with the use of techniques including brushed hairlines and metal polishing at micron-level precision to create a translucent metal surface. Additionally, the Ceramic White version of the P9 is smoother than the painted bodywork of premium cars, reflecting and refracting light to present different shades of awe-inspiring colors as ambient conditions change. The P9 is equipped with the power, connectivity and speed that today’s high-end smartphone user expects from Huawei. With a 5.2-inch 1080p display, the P9 is powered by the new Kirin 955 2.5GHz 64- bit ARM-based processor for leading-class mobile performance. The 3,000mAh high-density battery offers P9 users outstanding mobility and battery life. Huawei is also unveiling the P9 Plus, featuring a 5.5-inch Press Touch display and a larger 3,400mAh battery. The P9 Plus also offers dual-IC Rapid Charge, giving users six hours of talk time after a 10-minute charge. Leveraging Huawei’s industry-leading capabilities in telecommunications, the P9 and P9 Plus offer unrivaled new features including a virtual-triple-antenna architecture, designed for users who need robust and seamless connectivity to cellular and Wi-Fi networks to fully harness the power of the mobile Internet no matter where they are in the world. The P9 and P9 Plus also protect users’ privacy and information security with Huawei’s world-leading biometric fingerprint recognition technology. The enhanced fingerprint sensor allows users to personalize and safeguard their devices by significantly lowering the possibility of fraudulent or accidental device access, while also ensuring users can quickly and securely access their smartphone. Austria, Bahrain, Belgium, China, Czech Republic, Egypt, Denmark, Finland, France, Germany, Greece, Hungary, Ireland, Italy, Jordan, Lebanon, Kuwait, Netherlands, Norway, Oman, Poland, Portugal, Qatar, Saudi Arabia, Spain, Sweden, Switzerland, United Arab Emirates, and United Kingdom.